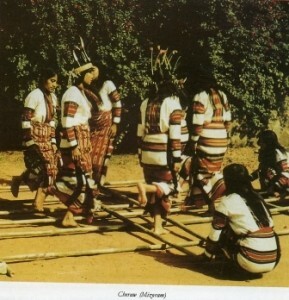 In the Union Territory of Mizoram the most popular dance is Cheraw. It is danced mainly by the girls of Mizo tribe. Although it is now performed at any rime, originally it was a ritual dance. It is inspired by a Mizo myth, according to which Pu Pawla is the custodian of paradise. When a child dies, the spirit proceed towards Pialral, the heavenly abode of the dead. The Cheraw dance is performed to propitiate the death of the child. The Mizos believe that if the dance is performed the spirit of the dead child will easily enter into the paradise without being harassed by Pu Pawla.